The 2016 Nissan NV200 is a small cargo van that can carry lots of stuff at a low price. It is not as powerful as rivals, but is efficient. The 2016 nissan nv200 electric vehicle qualifies for a federal tax credit of up to $7,500, effectively reducing the net base price. Nissan’s 2016 NV200 is a small cargo van that can carry an impressive amount of goods at a low price. The NV200 is part of a wave of compact cargo vans aimed at businesses and individuals desiring an easy-to-drive, fuel-efficient delivery vehicle. Nissan's compact commercial van scores points in that it's a snap to maneuver, small enough to park in a residential garage, and its blank-space cargo area behind the two front seats is ready for customization. Starting at less than $22,000, the Nissan NV200 is the value player among rivals like the Ford Transit Connect and Ram ProMaster City. But the NV200's lineup is more limited compared to those competitors, and its 4-cylinder engine isn't rated to tow. If you or your business needs a cargo van that's inexpensive to own and operate, fits almost anywhere and drives like a car, look to the Nissan NV200. Along with being customizable for shelving, multiple mounting points inside keep things in place, and the passenger seat folds to become a desk. If you need to tow or haul more than 1,480 pounds of payload, check out the more powerful Ford Transit Connect, Ram ProMaster City or the new Mercedes-Benz Metris. Those rivals are also available in passenger form, with the Ford offering seating for seven, the Ram, five; and the Metris, eight. The Nissan NV200 compact cargo van carries over unchanged for the 2016 model year. Though similar in name, the NV200 shouldn't be confused with its huge big brother -- the heavy-duty Nissan NV HD series of cargo and passenger vans. One of the biggest appeals of the Nissan NV200 is just how easy it is to drive and maneuver. Because this compact cargo van employs the same unibody construction as Nissan’s small cars, the NV200 rides and drives like a small SUV rather than a cumbersome, old-school cargo van. Aided by its electric-assisted power steering, the NV200’s tight 36.7-foot turning radius allows it to execute U-turns in the narrowest of confines. The Nissan’s tall, narrow body enables it to fit into parking spots overlooked by larger vans, and the huge windshield provides excellent forward visibility. We found the ride taut and the handling nimble. Nissan’s 2.0-liter 4-cylinder engine is no powerhouse, but the CVT automatic transmission makes the most of the little engine’s 131 horsepower, allowing it to scoot through intersections and merge with traffic without drama. Load the NV200 with cargo, however, and acceleration becomes noticeably sluggish. Nissan makes it easy to install shelving, racks or partitions thanks to the numerous (20 in all) reinforced mounting points strategically placed throughout the NV200’s cargo area. No need to drill or weld parts into place, just get some sheet metal screws and a Phillips screwdriver and you’re in business. The 60/40-split rear doors are more useful than a 50/50 setup. When open, the design provides a larger opening curbside while creating a smaller driver’s-side door less likely to get dinged by passing traffic. The NV200's interior places function over style. Nissan's tidy hauler hides 122.7 cubic feet of volume in its cargo bay and boasts a low, flat floor that makes loading a breeze. The cargo bay can hold standard 40 x 48-inch pallets. Payload maxes out at 1,480 pounds, below that of the Ford and Ram. Up front are two bucket seats, with the driver's seat offering a right armrest for added comfort. The passenger seat folds flat to create a desk or workbench, or more room for longer items spanning the cargo area. Audio and climate controls are simple but easy to use. Given its purpose as a box on wheels, the NV200’s styling -- or lack thereof -- isn't its biggest priority. Again, function trumps form. Accessibility is easy thanks to dual sliding side doors and 60/40-split rear French doors that open 180 degrees. At just over 21 inches, the cargo load floor is about two inches lower than that of the Transit Connect and slightly lower than that of the ProMaster City. At 186.3 inches, the NV200 is just a few inches longer than a Nissan Sentra sedan. Unlike the Transit Connect, however, the NV200 does not offer a choice of lengths. The 2016 Nissan NV200 remains available in two trims: S and SV. The base S model comes with air conditioning, cargo-bay floor protector, cargo-area work light, manually adjustable front seats with vinyl wear patches, power windows, and a 2-speaker AM/FM/CD audio system with an auxiliary input for portable music players. As it's only $890 more, we recommend the higher-trim SV model. It adds cruise control, an additional 12-volt power outlet in the rear, six D-rings mounted to the cargo floor, power door locks and remote keyless entry, and power heated exterior mirrors. All new NV200 models come with a 5-year/100,000-mile warranty. Both trims of the Nissan NV200 can be had with rear-door windows, something we recommend for better visibility and overall safety. A window is also available on the passenger-side sliding door. Rear sonar sensors are optional to make backing up easier, and a rearview camera is available on the NV200 SV. Cruise control can be had on base models, and both trims offer Bluetooth hands-free phone connectivity. SV trims can be further upgraded with the NissanConnect navigation and mobile app system that includes a 5.8-inch touch screen, voice recognition and USB input. The 2016 Nissan NV200 makes do with a 2.0-liter 4-cylinder engine that produces 131 horsepower and 139 lb-ft of torque. A gearless continuously variable automatic transmission (CVT) sends that power to the front wheels. With its latest CVT, the Nissan NV200 returns impressive fuel economy of up to 26 mpg on the highway and 25 mpg combined. The Nissan's powertrain is thrifty and runs on regular unleaded gasoline, but it's also weaker than the engines found in the Ford Transit Connect and Ram ProMaster City. If you require even more grunt -- and up to 5,000-pounds towing capacity -- check out the larger Mercedes-Benz Metris. The 2016 Nissan NV200 has a Manufacturer’s Suggested Retail Price (MSRP) starting at $21,755 for a base S model. At only $890 more, we suggest the SV model, with features like cruise control and power door locks. 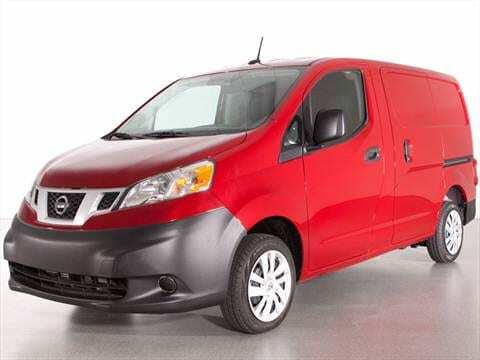 Fully loaded, a Nissan NV200 can reach over $24,000 with options. The Ford Transit Connect cargo van starts over $23,000, while the Ram ProMaster City starts beyond $24,000. The mechanically similar Chevrolet City Express bows slightly under $23,000. The new Mercedes-Benz Metris cargo van starts around $30,000, but is significantly more powerful and larger, yet can still be parked in a residential garage. Here's an in-depth comparison of small cargo vans. Using that helpful link, you can also check the KBB.com Fair Purchase Price to see what others in your area are paying for their new Nissan cargo van. In the years ahead, we predict the NV200's resale value will be decent, on par with that of the Ford Transit Connect.